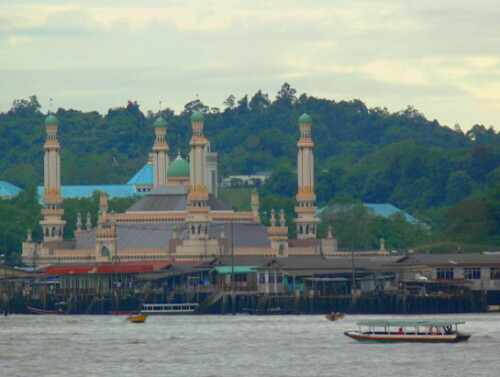 Sultan Omar Ali Saifuddin Mosque on the left was built in 1958 by the 28th King of Brunei who passed away in 1984. Apparently there is enough money to go around in Brunei that each Sultan has their own mosque built after them. The gold you see in the picture is gold plated, with the rest of the mosque made up of marble and other expensive material imported from Europe, China and Saudi Arabia. The mosque on the right is the largest in the far east and one of the most beautiful in the world. 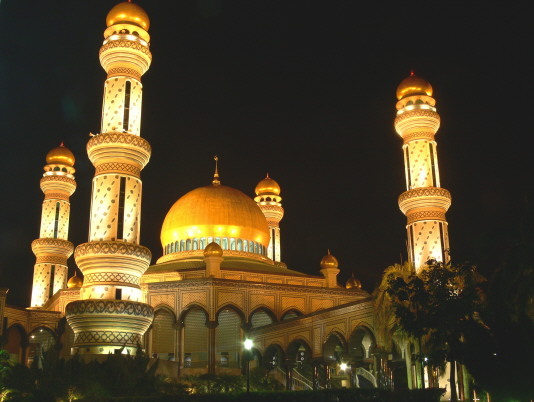 This one is called the Hassanal Bolkiah mosque built in honor of the 29th Sultan of Brunei. 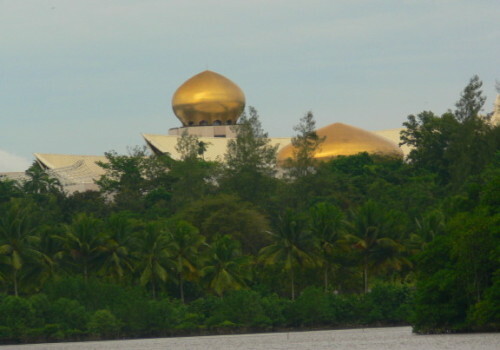 Above is a photo of the capital of Brunei called Bandar Seri Begawan. 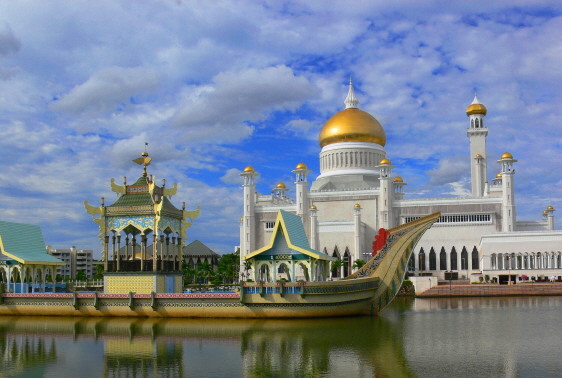 The entire country of Brunei is only about 10 times larger than a city-state country such as Singapore. The country’s population is just shy of 400,000 people which is much less than Washington DC. The capital’s population is is home to 15% of the country with 45,000 people. 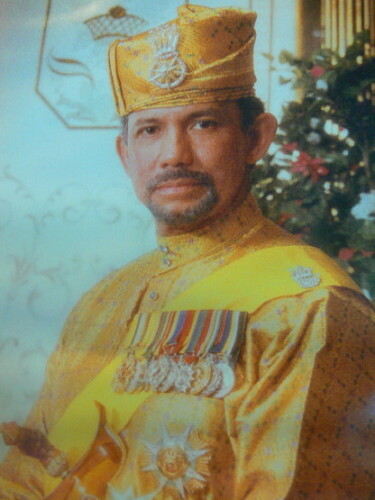 Here you can see Sultan Hassanal Bolkiah; current ruler when I visited Brunei. Above is the best practical view you can get of his palace. 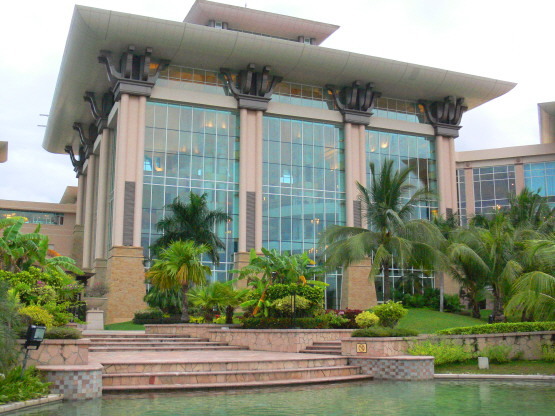 When I was in Brunei the King was the 14th richest man in the world living in the largest residential palace on earth. He has an interest for sports cars and owns around 4,000 of them. This includes 500 models of Rolls Royce’s alone! If that is true then he would have to drive 11 different ones a day in order to get behind the wheel of all his cars in single year. Aside from his own personal possessions he’s also rumored to be a very generous man. It’s said that the King once visited Cyprus and left a $170,000 tip at the hotel he was staying at! Along with their own mosques each Sultan also gets their own burial places after they pass away. Some are put in a cemetery next to previous Kings while some have their own tombs along the above river. 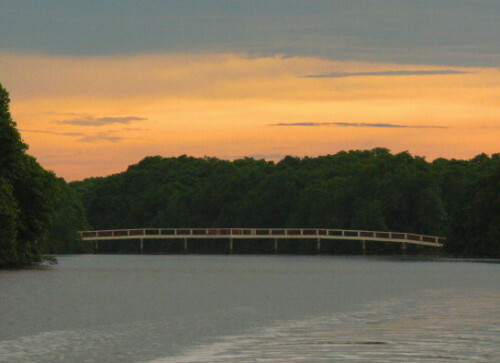 On the left is a bridge crossing the river that leads to the tomb seen above. This tomb belonged to the 6th Sultan of Brunei who ruled about 500 years ago during the 16th century. If you haven’t figured it out by now Brunei is officially an Islamic nation although only about 67% of the country actually practices the religion. 10% are Buddhist and another 10% are Christian with the remaining practicing Chinese religions and indigenous beliefs. 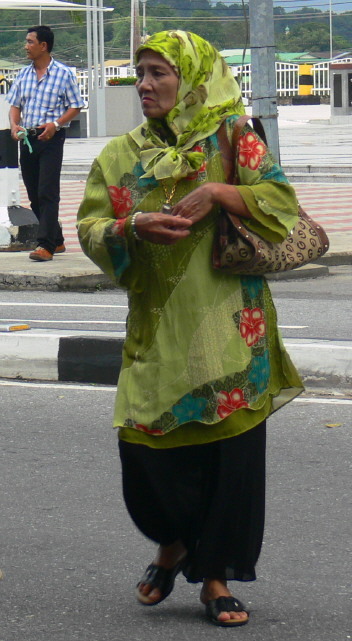 A large portion of Brunei’s population are from surrounding countries like Malaysia. 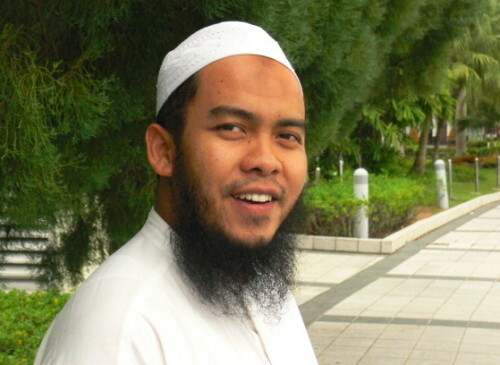 The man above lives in Brunei but is actually from Malaysia. On the right is a native woman of Brunei. After I took the photo on the right I was stopped by security who asked me what I was doing in the area. They actually by chance were working for the US embassy. 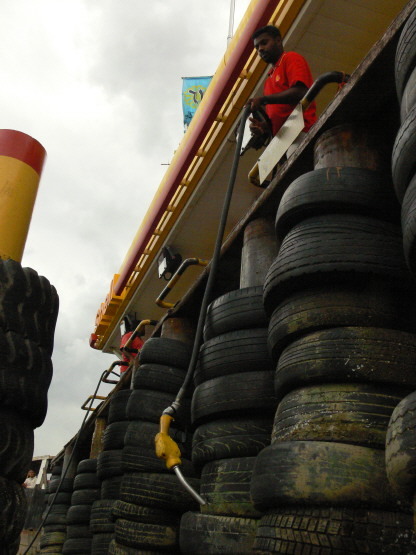 They were polite and after a question or two sent me on my way. Much of Brunei’s capital Bandar Seri Begawan is made up of fine restaurants, malls, and other shopping districts. On the left is one of the smaller malls in Brunei’s capital which is also the only real city in the country. 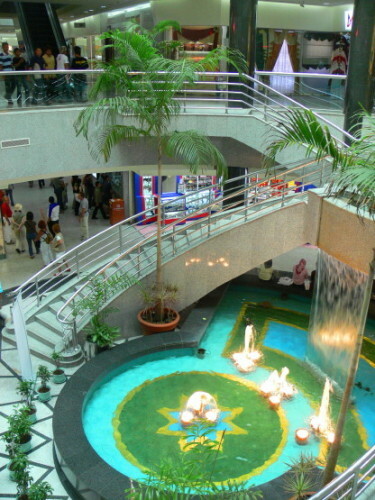 The second picture on the right is Brunei’s main mall simply called ‘The Mall’ and is surrounded by western restaurants and other attractions outside. 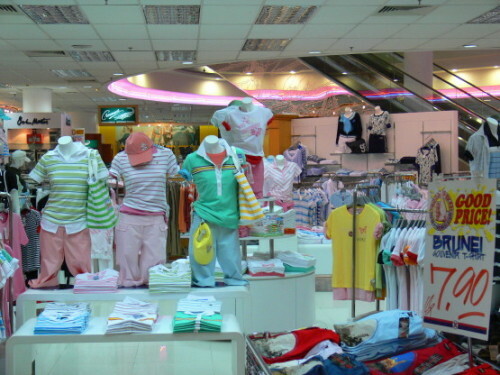 I never went out for the night life in Brunei. While I’m sure there are places available to grab a drink I never got the vibe that there were any crazy night clubs or party scenes here. There might not crazy clubs like in the rest of southeast Asia or Europe, but there is definitely no shortage of luxury in Brunei. The empire hotel above was created by converting one of the former palaces into a hotel for guests. 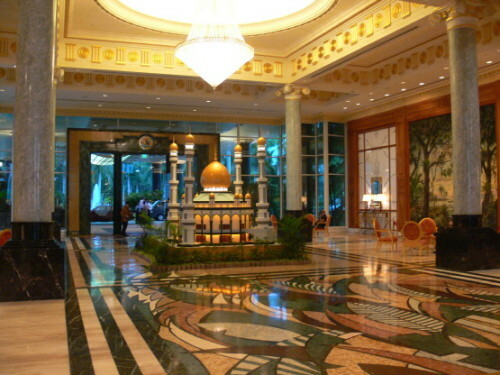 If you ever dreamed of staying in a palace then Brunei is your best bet. 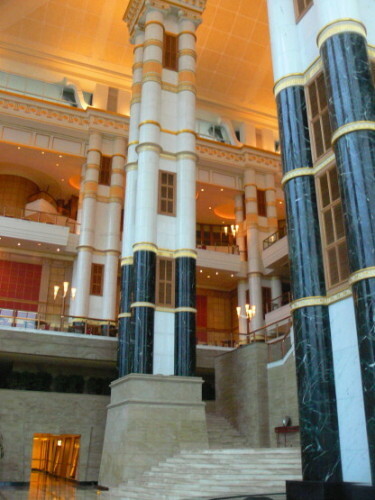 The upper left photo is the hotel entrance and lobby. On the right are some giant marble columns in the center. You have to be pretty well off to have a night at this hotel, rates start as low as $700 and run up to $22,000 for just one night! On the left is another picture of the Empire hotel from the outside. The hotel itself has all you need including a large gym, a movie theater and other entertainment. 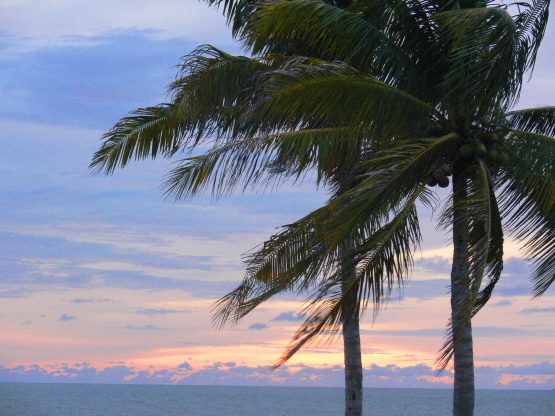 Of course Brunei is right on the South China sea, so the hotel is built along the beach. Another key benefit of staying here is the hotel usually isn’t crowded. You’ll almost definitely have most of the place to yourself. I wouldn’t be surprised if some people went into the movie theaters and were the only ones there. I asked a local man how the hotel could stay in business with such few guests. His reply was it that the hotel is government owned, so if they made money then great, if not then they didn’t really care since they are so rich anyway. The two pictures above are also from Brunei’s capital Bandar Seri Begawan showing some more humble houses. 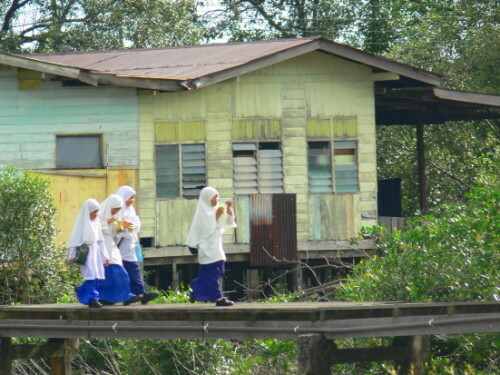 On the left are some girls walking past their homes in the center of the city. On the right is another house with a ton of trash underneath it. 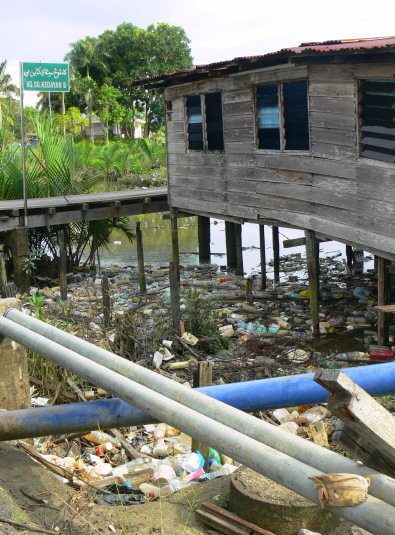 Of course most parts of Brunei were very clean, but some streets and rivers had huge piles of trash which was something I didn’t understand in such a rich country, I imagine a phone call from the right person could get this cleaned up overnight. 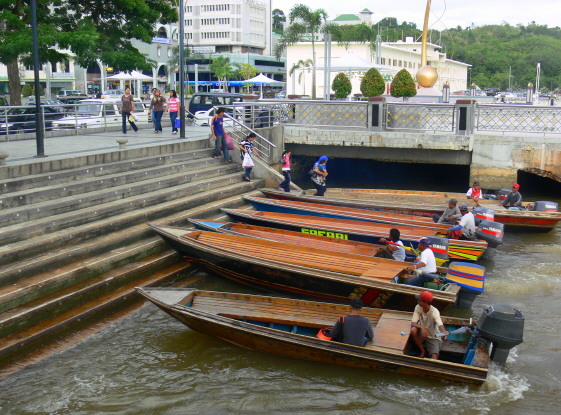 After I was done exploring the capital and Jerudong Park, I took a water taxi and went along the rivers in search of wildlife. The taxis on the upper left are all hanging out waiting to give someone a ride, so it’s pretty easy to walk up and do your own excursion. You can tell them all your destination and let them fight among each other for the price and then just take the lowest bidder. Another famous part in Bandar Seri Begawan is its water village where over 30,000 people live or close to 10% of Brunei’s population. The water village is connected by a network of boardwalks that link houses, restaurants, mosques and schools together. 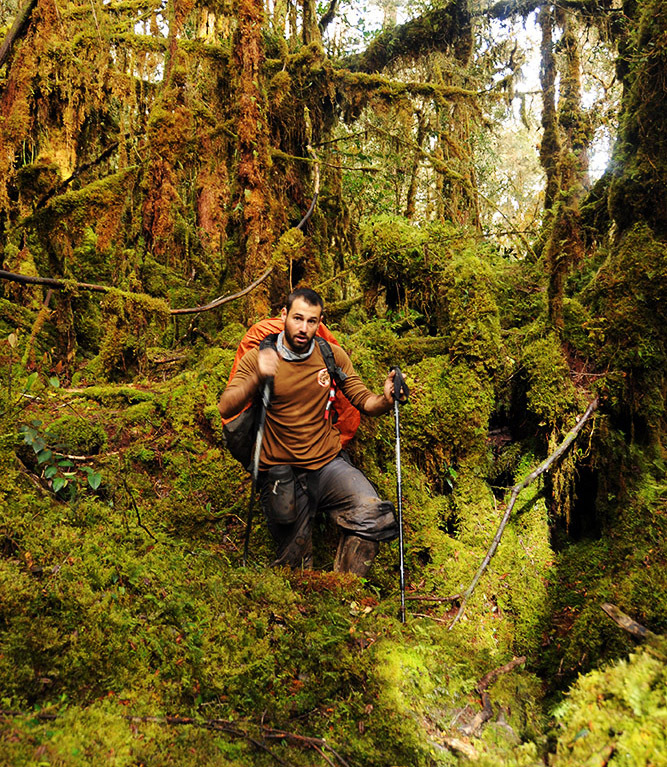 People have been living this way for over 1300 years. When the first European’s visited in the 16th century they named it Venice of the East. 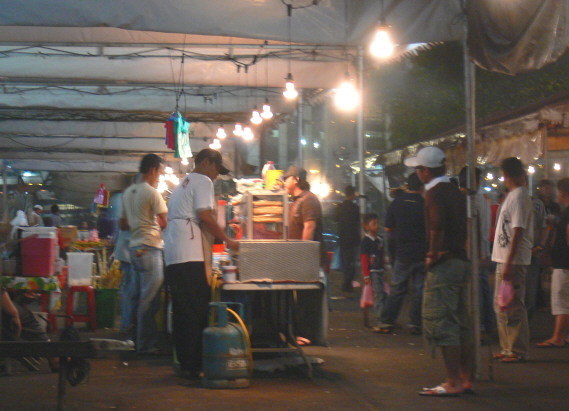 On the left is the city’s main market. On the right is one of my first views of the water city from a distance. 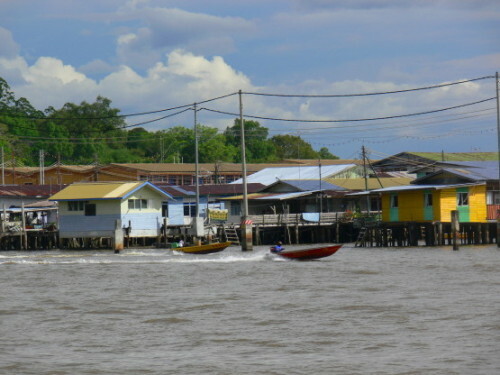 On the upper left are some the small but colorful houses in the water village with several boats racing by. 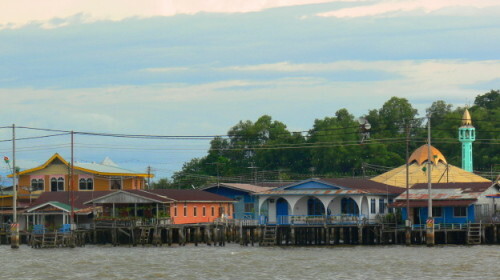 On the right is the water village’s largest mosque. I imagine all the water village people can reach the mosque by the boardwalks. 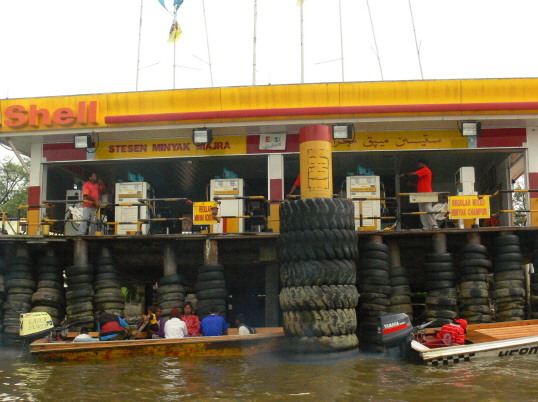 An interesting sight to see is the one of the gas stations for the boats. You pull up in your boat and some of the workers will lower a long hose for you to fill up your tank. 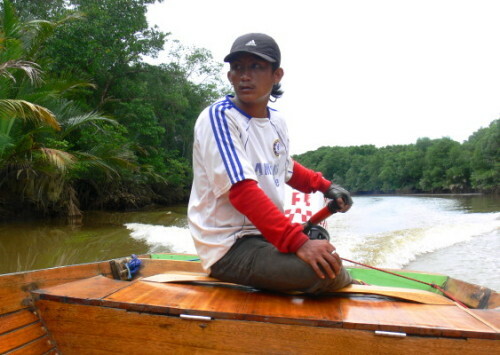 The rivers here are brackish waters, a mix of salt and freshwater. 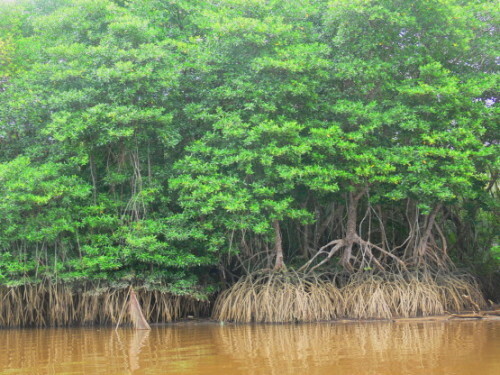 The vegetation along the banks is made up of mangrove forests, trees that have adapted the brackish waters and rising and lowering tides. Above is a photo of the forest meeting the river; on the right is inside the treeline. 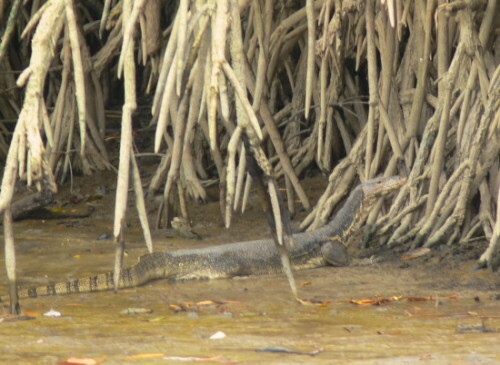 Notice on both pictures how high the roots extend out of the water. The left picture was low tide, while the right is high tide. 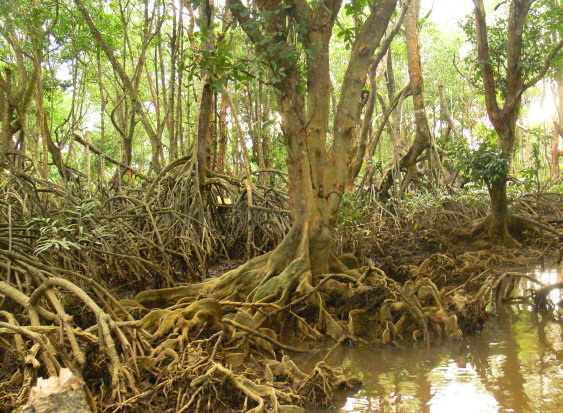 I did two trips through these mangrove forests. 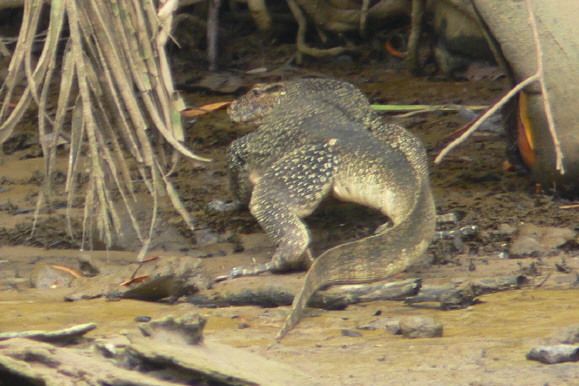 On the second time during low tide I came across almost 10 giant lizards called monitors. These alligator sized lizards are huge, and were found along the banks of the river. All of them were shy and quickly ran away when we approached them. On the left is a monitor relaxing on the bank, on the right is one running back into the mangrove forest. 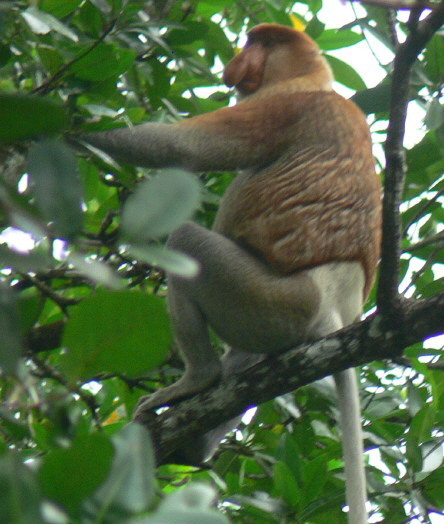 One of Borneo’s treasures are the Proboscis monkeys that are endemic to the island. 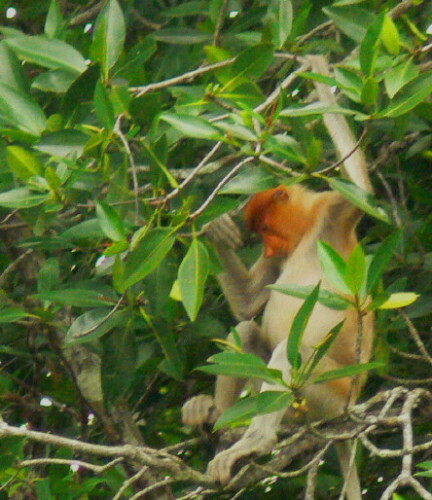 I’ve seen these strange monkeys before on television who became famous because of the male’s strange noses. 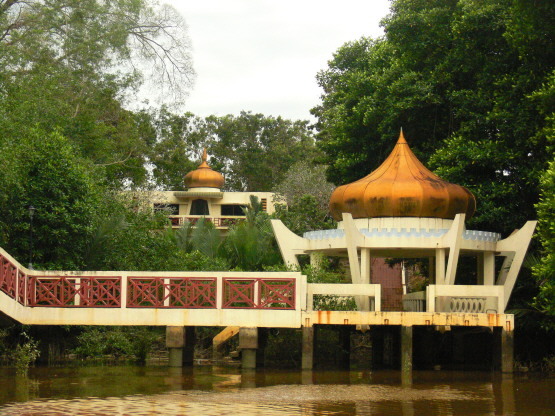 Until I came to Brunei, I had no idea that the only place in the world they existed was on this island. On the left is a large male which are the ones with the exaggerated noses, on the right is a female who looks deep in thought.